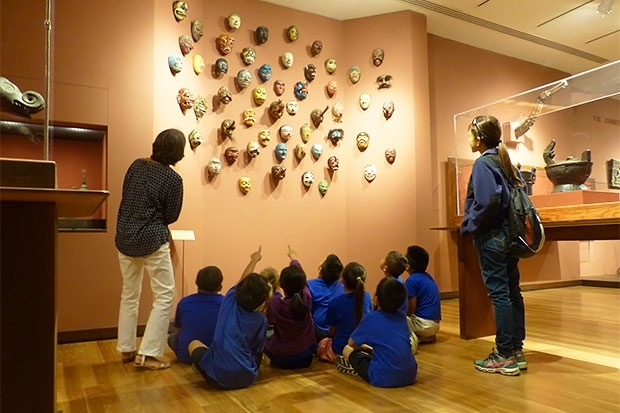 “What kind of animals might these be?” docent Howie Reinker asks the Makakilo Elementary School first graders huddled in front of the wall of masks in the Indonesian gallery. “I see an eel! By the one with the tusk,” one boy says, pointing up at a mask with a long, curling nose. “Oh yeah, the one right there,” a girl says. “Oh, a vampire!” someone shouts. “Maybe a bird?” Reinker suggests, pointing out feathers lining its edges. Reinker accepts the evidence, and guides them on to the next piece. Welcome to a See Art, Make Art guided school tour. As the name suggests, students on these tours look at works in the galleries and create works of their own—though not necessarily in that order. Last week, kindergarteners and first-graders from Makakilo had an animal-themed tour that went in reverse—effectively a Make Art, See Art tour. The students made their own masterpieces at the Art School two days before their visit to the Indonesian gallery on Thursday. Art School teaching assistant Sheanae Tam helps a student get started on a clay animal. As funny as that might sound, it’s actually encouraged. When Reinker leads the students through the galleries, pointing out items like masks, and a bench with a vaguely elephantine face on one end, she’s demonstrating the artistic impulse to interpret and stylize nature. “The students are being inspired by art,” says Makakilo Elementary teacher Julie Membrere, who follows her students through the galleries, making sure they don’t suddenly turn it into a See Art, Touch Art tour. “Most of them have never had the experience of a museum. They’re seeing how what you normally think an elephant would look like, it doesn’t have to in art. Those who made elephants [in clay] are seeing that it didn’t have to be that way—it could have six legs, a broken tusk—you can be creative. That’s why the oohs and ahs are coming out,” she says. 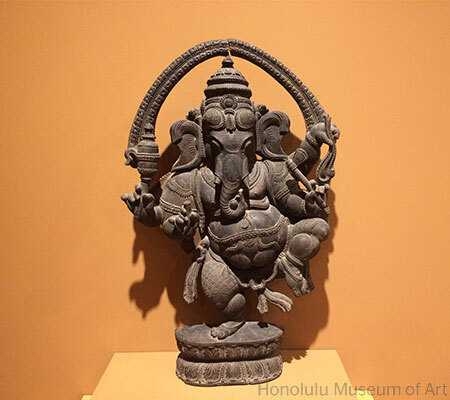 Membrere is referring to HoMA’s early 20th-century sculpture of Ganesha, the six-limbed Hindu god known as “The Remover of Obstacles.” It’s a fitting teaching tool for five and six years olds learning that, in art, it’s OK to break the mold.